2016 was the first year since graduating university in 2010 that I did not have to make a single student loan payment. What a relief that was! Now our student loan payments could start flowing into our investment accounts, rather than to Sallie Mae, USAA, or Navient. All together my wife and I paid off more than $100,000 in student loans. It's tough to think about how much closer we would be to financial independence if instead of paying off all that debt we could have been investing during the 8 year bull run. During our debt repayment process, we utilized 8 tricks to make the process less stressful, easier, and faster. Automatic payments means you never have to think about missing a payment and paying a late fee. It also means you don't have the stress of logging into your account every month to make the payment. Most student loan companies allow you to set up automatic payments. If they don't, you can usually do a web bill pay through your bank to make the payments automatically. If your payment is $220, make it $300. If it's $167, make it $170. Whatever you do, even if it's just round up to the near dollar, round up and make a little bit extra payment. It's amazing how quickly a few extra dollars can knock down your balance and reduce your time of repayment. I made the goal to always round up to the nearest hundreds of dollars. That way it felt like I was making a substantial impact towards the balance of my loans. Start by paying off your highest interest rate debt first. Then, when that loan is repaid, move the payment you were making towards that loan to the next highest interest rate loan. Now you will be making extra payments and your balance will drop much faster. Dave Ramsey advocates a similar approach by paying off your lowest balance loan first. Whatever technique works best for you, the important thing is not to reduce your total payments when a loan is done. Don't budget down to the dollar. Always have an emergency fund and a few extra dollars set aside in the monthly or weekly budget for the little things that pop up. I call this breathing room. It can be stressful when you are still a few days away from your next pay day and you only have $20 in the checking account. Give yourself some financial maneuvering room. Keep a few dollars set aside so when you get depressed at how long it will take to pay off your loans, you can have friends over for dinner or drinks. Life is too short to deprive yourself of joy and friendship while you pay off your debts. Our monthly student loan repayments were $1000/month at one point. After knocking out one of the loans, our required minimum payments were only $220/month at 1.75% interest. I thought this level of repayment was doable even if we were to lose our jobs, so I only made the minimum payments for a year and invested the extra $780 into my TSP. This relaxing of the debt repayments in order to make investment contributions made sense at the time. We were expecting to sell our condo at the end of the year and use the proceeds from that to make the final payment on my student loans. Every situation is different, but recognize that if your monthly payment is low, the interest rate is low, and you have opportunities to invest in the TSP or your IRAs, take advantage of it! Be aware that when you relax your payments, you are extending the time it will take to become debt free. Maybe take a break for a month or two and then get back into it. When we sold our condo in the Pacific Northwest, we netted over $40,000. Rather than taking that money and investing it, my wife and I decided to make the final blow against my student loans. Was it the most mathematically correct solution? My student loans and auto loan were under 3%. Considering we could get 6-8% long term in the stock market, investing made the most mathematical sense. But personal finance cannot just be pure math. I sleep much easier at night knowing that if I lost my job tomorrow, my required monthly expenses are food, water, and shelter. I do not have to work to pay my creditor. And that is worth giving up a few percentage points of return in the long run. We frequently rented our condo on AirBnB while we were paying off our student loans. Sometimes just the couch, but often the entire apartment, especially when I deployed. The $10,000 we pulled in from AirBnB made our life so much more enjoyable and the student loan payments much easier. 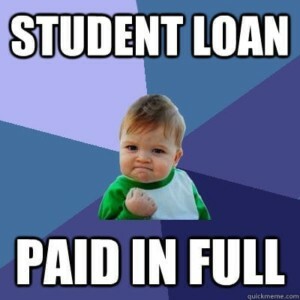 When you get your student loan balance down to a few thousand dollars, don't wait to pay it off! If you have a substantial emergency fund, use some of the cash in there to pay off the debt and be rid of it forever. Then just make the debt payment to yourself back into your emergency fund to top it off again. I did this when I paid off my USAA Career Starter Loan and it was great knocking that loan down 2 years early on my first deployment! Don't hesitate to become debt free. The earlier you can refinance your student loans, the more you can save. If you have federal loans locked in at 6.8% or even higher, take a look at SoFi or the USAA Career Starter Loan to refinance your student loans to a much lower interest rate. You could save hundreds or thousands of dollars, even if you are prioritizing your payments and paying down the debt faster than scheduled. How about you reader? Did you use any of these techniques to pay off your loans? I wish I can still follow this. I have been struggling with student loan for so long. Thanks for sharing. Great round up of your student loan strategy. I’ve often wondered what we would do with a windfall, and i’ve decided we won’t crush that last bit of Student Loan debt (the 4% and below bit…) but it is super tempting. I’ve been reading more of ERN’s Safe withdrawal series and its scaring me into investing even more in these early years. I only wish i had been financially smarter, sooner! We really liked the idea of becoming debt free. Even though the windfall could have been invested and would have rode the bull market for the past 2 years, having the additional cash flow every month without student loan payments is extremely liberating. Whatever works best for your situation, commit to it!